International Journal of Research in Health Sciences,2014,2,4,1091-1096. Reproductive and Family Health Department of Faculty of Public Health, Hasanuddin University, INDONESIA. Early initiation of breastfeeding is one of the health department programs in Indonesia intended to provide early stimulation of the beginning of breastfeeding provision hoping to be sustainable for the first six months (exclusive breastfeeding) due to the failure of early initiation of breastfeeding and exclusive breastfeeding provision at that period. This is potential to cause nutrient deficiency at infant and may cause malnutrition status resulting in the decrease of infant IQ and becomes a threat to Indonesian human resource in the future. The study aimed at determining the influence of factors such as education, knowledge, mother’s attitude, midwife action and family support. The study was cross sectional. The samples were mothers who gave births at the Mamboro public health center in North Palu. 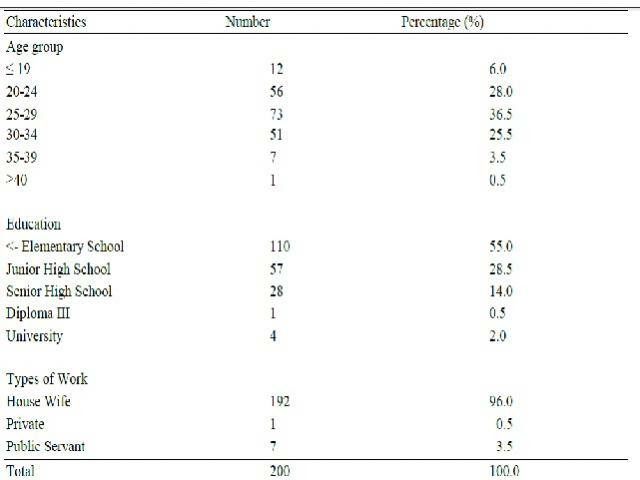 The number of samples was 200 people selected by simple random sampling. The data were analyzed by univariate, bivariate with chi square test and multivariate analysis using multiple logistic regression. The results of the study reveal that the five variables analyzed with bivariate have a correlation with the implementation of the early initiation of breastfeeding. The multivariate analysis reveals that there are two variables contributing to the implementation of the early initiation of breastfeeding: midwife action in which p= 0.006 and family support. It can be concluded that midwife action and family support are important determining factors to the implementation of the early initiation of breastfeeding. The main determining factors to the implementation of the early initiation of breastfeeding in Mamboro public health center are midwife action and family support.